Not a lot happens in this issue, except one major thing, and Selina’s agonizing decision leading up to it. It’s tough to be a leader when those who are supposed to be loyal to you actually don’t trust or like you. Selina is head of the Calabrese crime family, and oversees several other families, but all of them question her authority. This is exacerbated by the fact that she is constantly told that she is not really a Calabrese. Selina is a lot more human, multifaceted, and sympathetic than she was in previous arcs before Genevieve Valentine took over. Here, Selina is a woman whom we can feel the stress of maintaining order and keeping others from casting votes of no confidence. Valentine continues her habit of beginning each issue with quotes from famous, commanding women in history. This time, the quotes come from the richest pirate of all time, who was known for being ruthless. 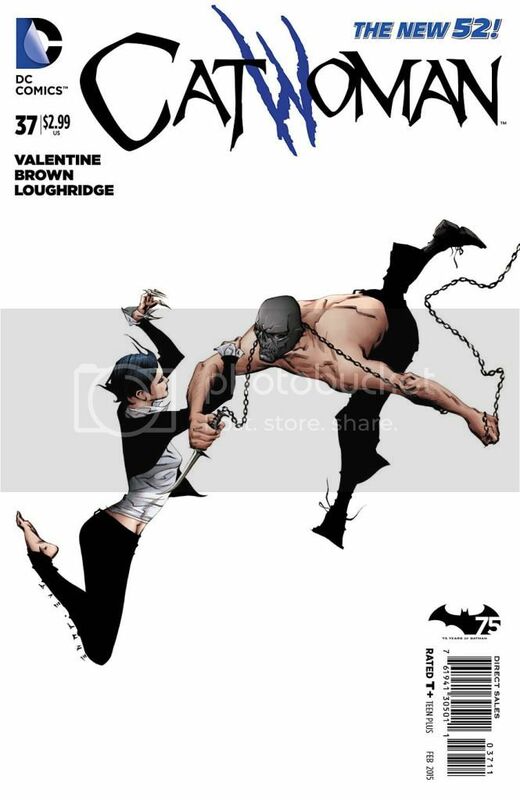 Valentine excellently writes Selina’s mental processes through this story: is she willing to be ruthless? Are there any alternatives? The climactic scene featuring Antonia and Nick Calabrese is moving. We see a sister and brother who have shared a lot of history, but have had some distance between them as well. Antonia has become one of my favorite characters in this book, along with Selina. Antonia’s loyalty to her family name and to Selina are tested considerably. The resolution comes quickly. I wonder how the traumatic events here will change things for Antonia in future issues. Will she always show this kind of loyalty to Selina? 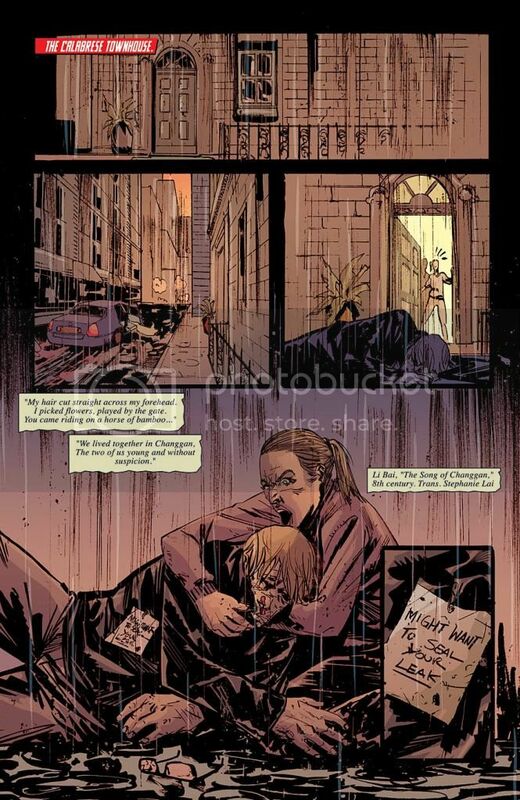 Garry Brown’s drawing of rain and puddles right from the first page sets the dark tone. The facade of the Calabrese townhouse looks lovely. I like the real world setting of this Gotham: it doesn’t feel like we’re in a superpowered/supernatural/fantasy realm. In fact, we’ve yet to see any supernatural plot points in Valentine’s arc. This story feels like an old-school gangster movie: slow, deliberate, where the dialogue flows like thick gravy or sauce, not a brisk stream. I really dislike the character Ward: he seems to be there just to be an enforcer of what the Calabrese family “should” stand for. This could be endearing if it were a likable character — e.g., Alfred of Wayne Manor — but instead, we just feel like Ward is a slimy, disloyal opportunist lurking in the shadows, waiting to celebrate any of Selina’s missteps. Why does Selina keep him around? He’s obviously not family. If I were her, I would get rid of him soon. It seems like Ward could easily be paid off by another crime family — a plot point that for Selina’s sake, I hope doesn’t happen. The visual style here is complete and detailed, though in a fairly spartan aesthetic. Lee Loughridge’s colors have a soft focus, with simple backgrounds of pea green and pale orchid casting shadows on characters’ faces. Jae Lee’s cover is fantastic, particularly Selina’s claws, but it might be misleading: Selina does not in fact fight Black Mask. This is a slower moving issue, but with thoughtful unpacking of Selina and Antonia.